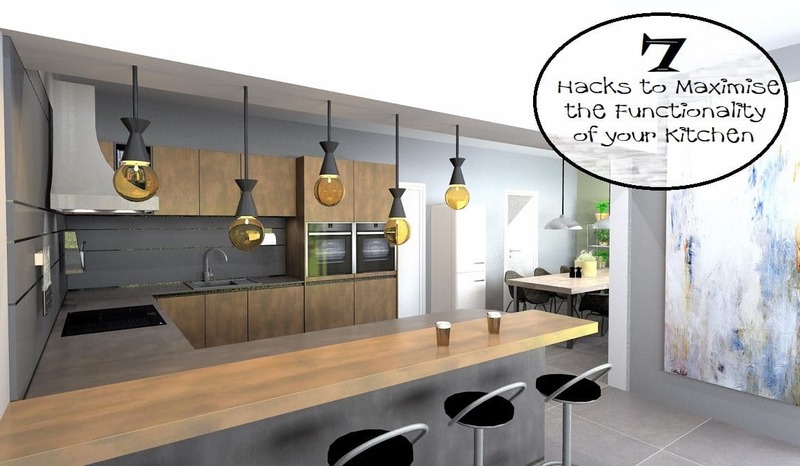 A functional kitchen design must include appropriate lighting. Think about the areas of the room and what they’ll be used for. You need bright lights over the worktops, hob and island so they’re well-lit for preparing and cooking food. Spot lights or a row of pendant lights along the length of the island are both functional and contemporary and give plenty of light. 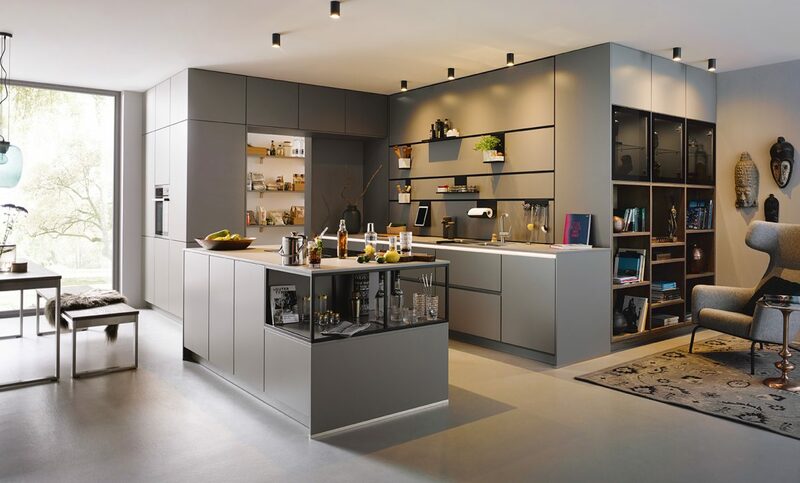 Under-cabinet lighting is a popular choice as it can give you extra directional light for your work surfaces or, when used on their own, they create an ambience in the room with a subtle glow. Statement light fittings or a group of pendant lights work really well over a dining table. 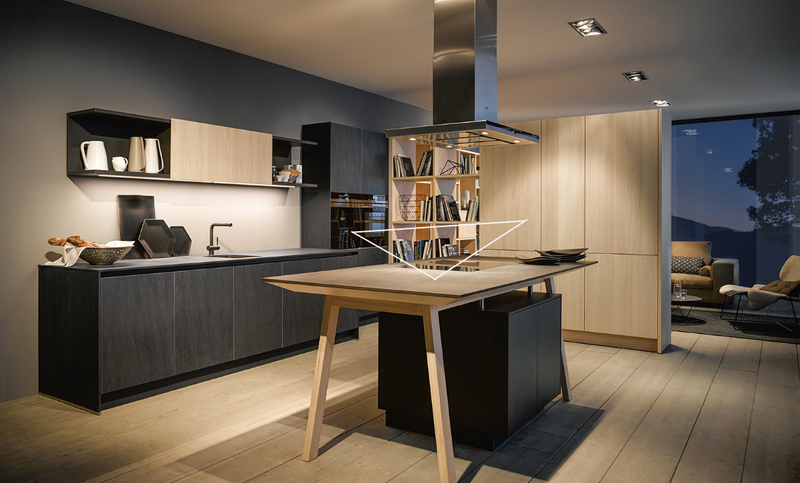 Still one of the most important elements of a functional kitchen is the ‘work triangle.’ This is the concept that the person cooking and preparing the meal has three major points of contact: the refrigerator, the sink and cooking area. The work triangle connects all points of contact with an invisible line which helps to create the most efficient workflow in your kitchen. 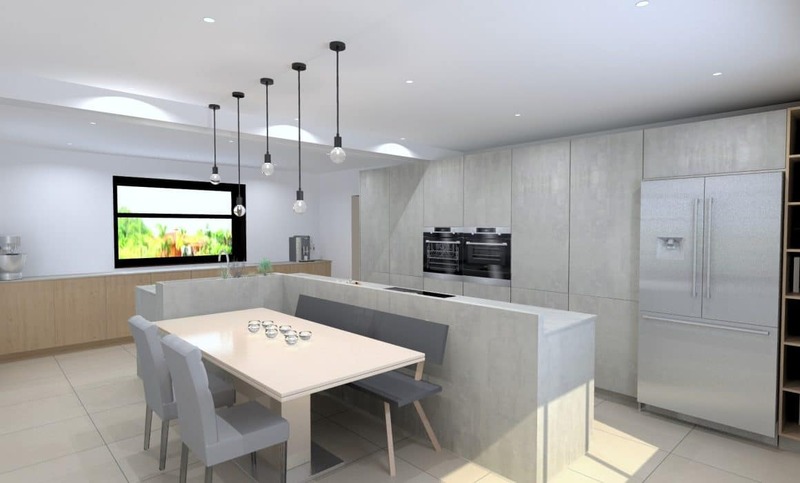 If you’re updating your room, a good designer will help you with the positioning of your appliances in a way to optimise the functionality of your kitchen. Once you have a working triangle, you need to keep the space between the three points clear from clutter to ensure the functionality isn’t compromised. 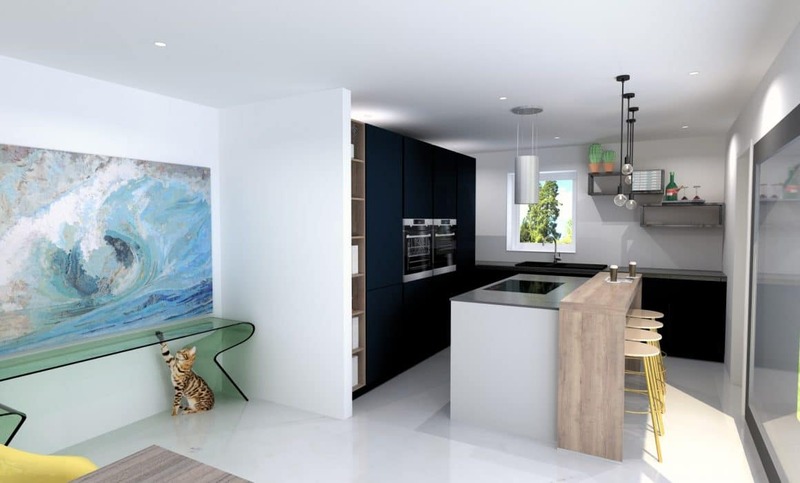 The kitchen is the heart of the home but, whilst it’s lovely that it’s where everybody congregates, too many people in the area can block its important functions. People tend to gather in the kitchen to chat with the cook so, strategically place seating away from your kitchen triangle/preparation area. This keeps your visitors out of the functional space so you can prepare the meal but they’ll still be close enough to have a conversation comfortably. A bar with stool seating works well as long as it’s situated on the opposite side of where you’ll be working or on the short end of the island or peninsular. 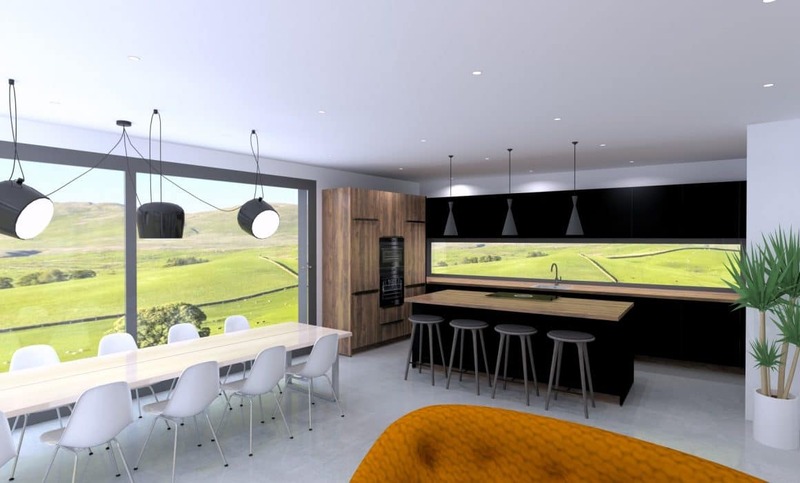 You could have the most innovative kitchen design and a high-end kitchen but if your cabinets, worktops and preparation areas are cluttered, it’s all a waste and the functional aspect of your kitchen is affected. You need to create some organisation that works for you and your family to keep things running smoothly in the kitchen. If you’re renovating your kitchen, it’s the perfect time to have a good sort out and get rid of redundant items. Be ruthless when you’re emptying your old kitchen and only keep the items you really need. If, on the other hand, you’re just trying to improve the room you have, try sorting through one cupboard each day; it’s less daunting than trying to do it all at once and within a fortnight you’ll be clutter-free and functioning better! There are more and more gadgets available now to help you create a functional kitchen, beyond just cooking. Pop up sockets are perfect in island units to give you electricity when there isn’t a wall to install a regular sockets. Wall panelling with rails to hang accessories are great for keeping items off the work-surfaces and accessories include mobile device holders to keep recipes on your phone and tablet off the surface whist you cook. Also available are integrated sound systems and wireless chargers – not essential for a functional kitchen but, still pretty cool! 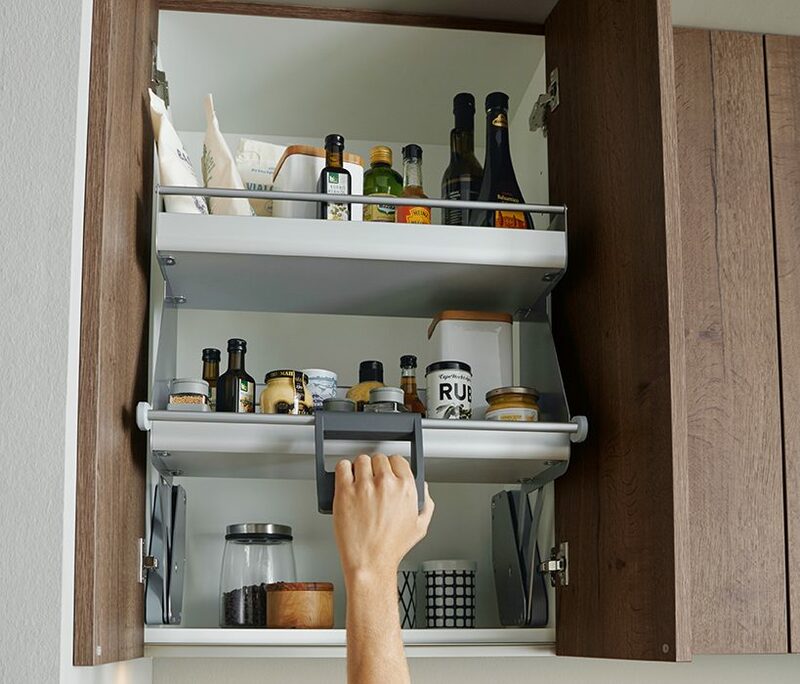 The correct storage solutions will help your kitchen function smoothly and effectively. It’s satisfying to use every available space and for everything to have its own place to live. The top shelves of wall units can be challenging and a waste of space if not used because they can’t be reached so, a pull down shelving unit (pictured) solves this issue perfectly. There are corner unit storage solutions that eliminate the need for a search party to find the cake tin in the back corner of your base unit and innovative storage and organisation for drawers including; pan lid holders, integrated foil dispensers, spice jars holders and built in scales. Appliance vary massively between brands and the amount of functions that they have. If you’re not a particularly keen cook, entry level appliances will suit you just fine but, if you’re more of a wannabe MasterChef you’ll be interested in the additional functions of the more expensive appliances. Whether you’re someone who’ll function well with just the essential appliances or need an integrated coffee machine, 2 dishwashers, a vac-sealer and a sous vide oven, a microwave tends to be a staple. If you have a free standing one think about mounting it on a shelf as they take up a lot of worktop space. Alternatively, during your re-design you can opt for an integrated microwave. Most manufacturer’s microwaves match their ovens so they can be installed next to each other to give a neat cooking area. Creating a functional kitchen is so important as it can change the way you feel about your room, not to mention make it a more enjoyable place to be and spend time. 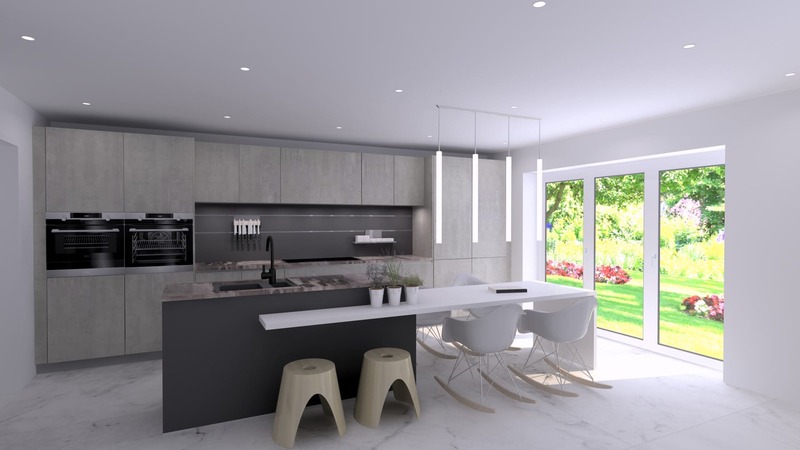 A good design service will offer an in-depth consultation so you can discuss how you like to use your kitchen, how much cooking you do and your wish-list. You can Book a Free Showroom Design Consultation online and secure some one to one time with one Artisan Interiors’ interior designers. If you’re not changing your kitchen, just using a few of these tips will increase the functionality of your current kitchen and improve how you use the space.